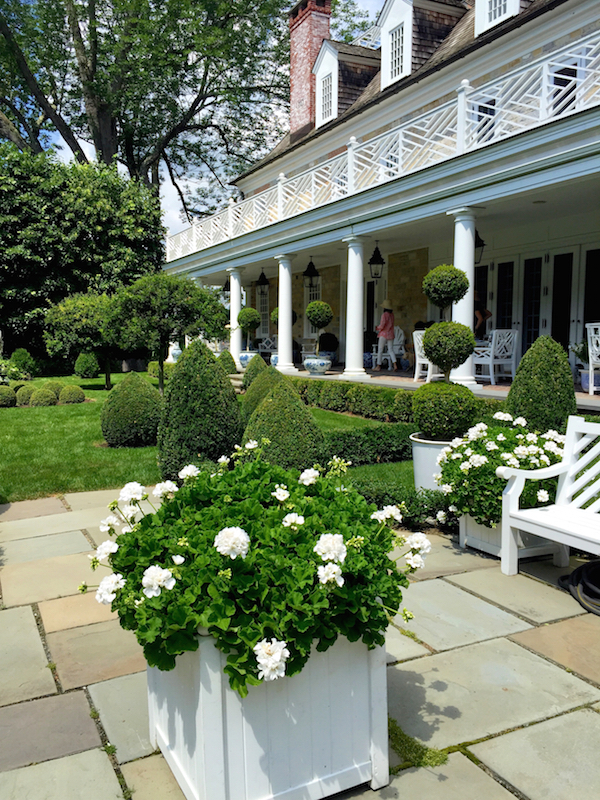 Carolyne Roehm is as at home in the couturier’s atelier as she is in the kitchen, in the studio or behind the lens, but nowhere is she more passionate than in the garden. In her 12th book, At Home in the Garden, Carolyne shares her lifelong love of nature as expressed in her glorious gardens at Weatherstone, her magnificent Connecticut home. Including all seasons and every aspect of the gardens, from the planning to planting to reaping the results, the book also features Carolyne’s latest accomplishment, her remarkable watercolors. And for all her many talents, she is an entertaining, down to earth and gracious hostess, eager to share a meal, a funny story and a good laugh. 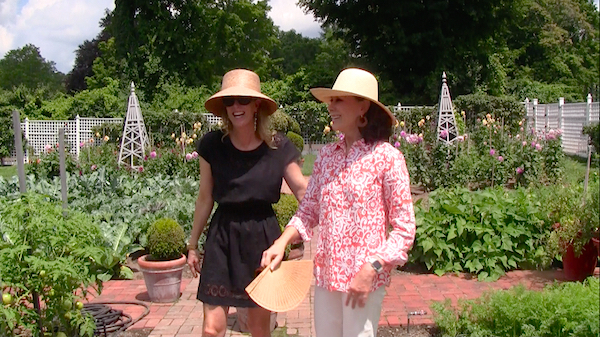 Please join Susanna and me as we take you behind the scenes for a marvelous afternoon with Carolyne at home in the garden. An avid and dedicated student, Carolyne never rests on her laurels, always searching for new and challenging ways to capture the splendor of nature in its many forms. 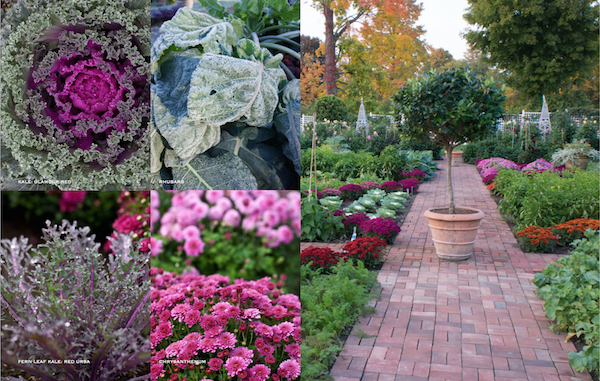 With photographs taken entirely by Carolyne, the book is truly a personal homage to her gardens at Weatherstone, which she has developed over the past 33 years from scratch. And it is worth noting, that while she oversees a staff to tend to the 59 pristine acres, Carolyne is also in the trenches, a hands-on participant in every aspect of the garden and property. She can tell you in detail about each and every flower, vegetable, plant and tree she grows. Not only is the book a visual delight but it traces Carolyne’s inspiring creative journey of her “passionate partnership with nature.” She likens her relationship with her garden to a love story, where both heartbreak and exultation ultimately “make you smarter, more mature, every more capable of fielding cosmic curveballs, and, surprisingly, more at peace.” It is an analogy that strikes home even for those of us with brown thumbs. Weatherstone is a large property, and yet each setting within the landscape is thoughtful and individual. 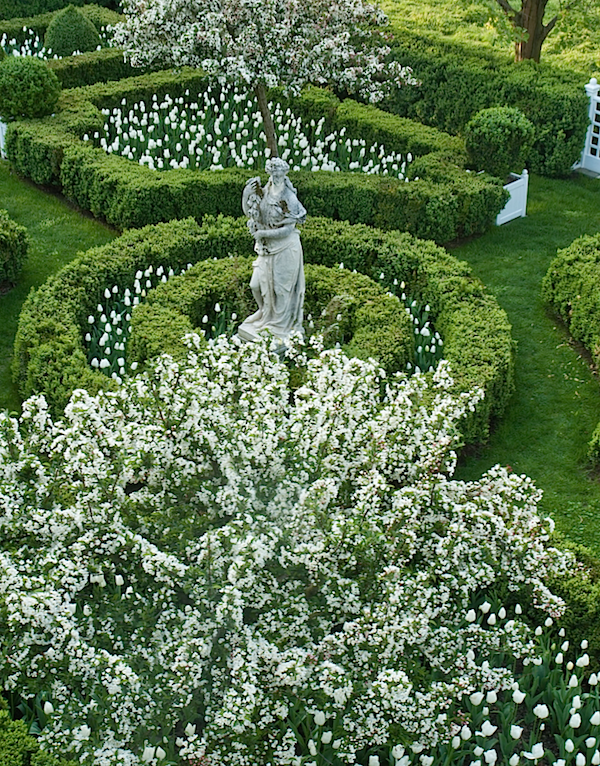 Balancing the practical with the philosophical, Carolyne shares lessons she has learned along the way including how house and garden are inexorably linked, as in the formal parterre garden below. From gardening tips and advice to inspirational arrangements and entertaining settings, you will be educated, enchanted and ultimately energized to be at home in the garden. Thank you Carolyne for the most magical afternoon – we loved being at home in the garden with you! This entry posted in art, At Home with, books, design, food and drink, garden, Quintessence video series, Stylish Shopping. 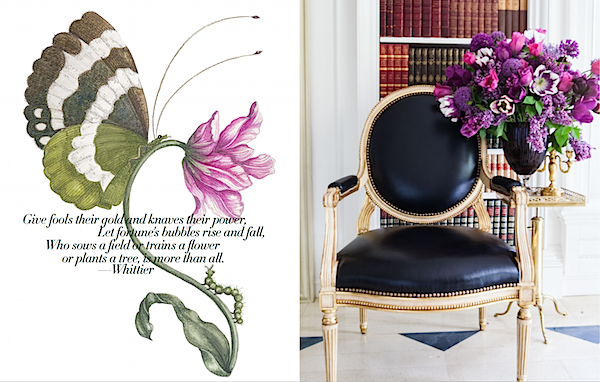 Entry Tags: Carolyne Roehm, Design Books, Flowers, Garden Books, Gardening, Gardens, video tour, Weatherstone Bookmark the permalink. This is the most amazing video. I am so impressed that one person has so much talent. Her watercolors were simply breathtaking. Spectacular piece in every way. I heard that you tore out your raspberries because they were not producing anymore. My raspberries have not been producing either. The berries would crumble in my hand or they were to small. Do you know why this is happening? Thank you ladies for this glorious post and video with Carolyne. She is so elegant and charming. Her gardens are extraordinary! I have loved Carolyne’s books and this video is such a wonderful treat. As a transplanted Yankee in South Carolina I am so excited to see what she will do on Charleston because I still haven’t figured out the garden here even after working on it for 5 years! I didn’t want this video to end. She has the best life. Swoon! That might be my favorite video of yours to date; I feel slightly in awe! Thank you for this beautiful video. I kind of wished it never ended. I hope you will do a video on her new home in Charleston. Again, very enjoyable video. Wonderful video! She is such an inspiration. I just cannot explain in words how much I enjoy your lovely homes and your taste of style. Next lifetime I want to come back as YOU! Who cannot admire such a talent with a driving passion for learning and seeking; what an inspiration to us all! Thank you for the video which brought it all to life in our living rooms. Here’s to a life both well lived and well loved! 83 queries in 1.322 seconds.